The Holidays are upon us again! This festive time of harvest into winter has been particularly exciting as the bears fatten, the waterfowl migrate, and the rut of the ungulates moves forward. Before I dwell deeper on the rut I must share with you a recent publication. My article, and accompanying photographs, “Fall & Winter on Maryland’s Eastern Shore.,” was just published in the Fall/Winter 2013 issue of Nature Photographer! The magazine can be found in all fine bookstores nationwide and will be released in pdf format in the very near future on www.naturephotographermag.com. One of my images was given the back cover too! Nature Photographer is a wonderful magazine that is run by some amazing individuals, which is quite rare in the editorial market. Kudos to Nature Photographer and all its readers! In the midst of our Thanksgiving celebrations another fall ritual is currently underway as I write this: the rut. The Whitetail Deer rut is peaking around the Chesapeake region and the central Appalachians. It is a most exciting time as the bucks search for females for the right to pass on their genes. With that comes the battle between rivals that are as analogous to a Mixed Martial Arts match. Males will fight brutally, sometimes to the death, during these months and the action is intoxicatingly addictive to witness. Prior to the Whitetail rut I was documenting the rut of the Elk, which saw its peak of action in late September into early October. As the cool mountain air begins to move through the valley, fostering the first color change of fall foliage, a primitive awakening takes over the bull elk. Throughout the forest you can hear their hauntingly beautiful bugle, a multipurpose vocalization that communicates to cows that they are a prime bull to breed with while telling other bulls they are dominate. The bugle is also a call to fight. Bulls will challenge each other by bugling and announcing their presence. This is also when they are the most dangerous. A recent viral video depicting a young male, called a “spike,” challenging a photographer in Great Smoky Mountains National Park caught the attention of many. For nearly seven minutes the testosterone-fueled spike began sparring with the defenseless human, which led to this elk’s demise by the park service. 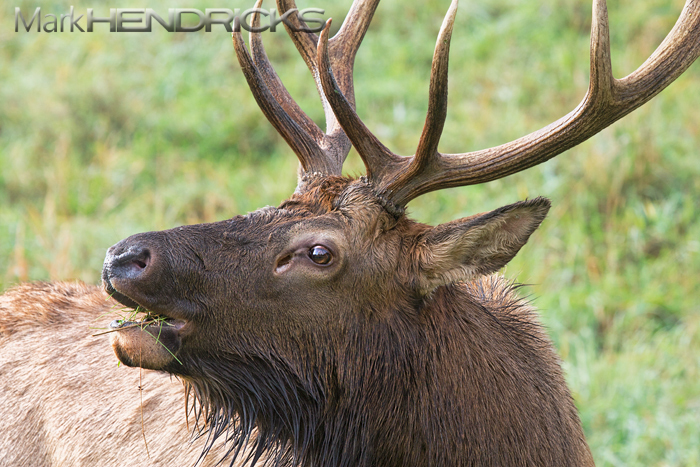 Young bulls and spikes frequently spar with each other but any, yes any, male during the rut can become unpredictable. Even if you are at a safe distance, if a male begins to turn his attention to you, slowly back off and get yourself out of the area. Bison, Elk, Moose, and Deer are responsible for more detrimental human interactions than any predator. Finally on Maryland’s Eastern Shore, the heart of the Delmarva Peninsula, another ungulate experiences their rut: the Sika Deer. 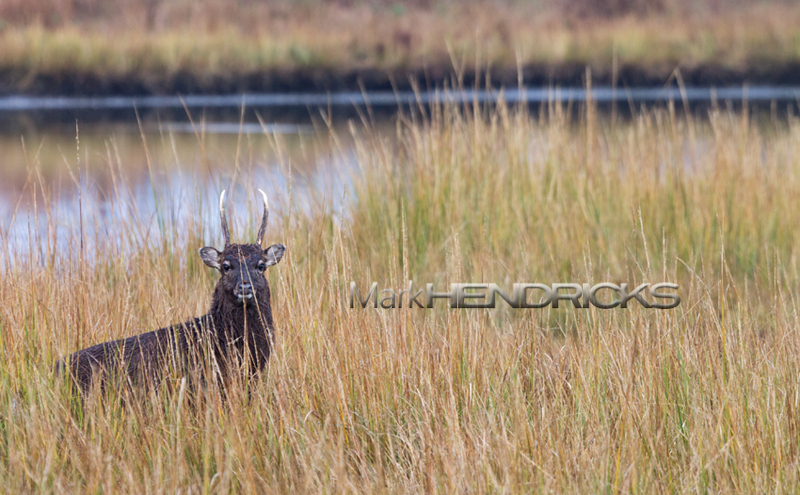 The Sika is an exotic elk from east Asia that has been a fixture on the Eastern Shore for over a hundred years. In Maryland I have not had much luck in capturing the male Sika (called a “Stag”) during the rut because of the nocturnal nature of their rut. 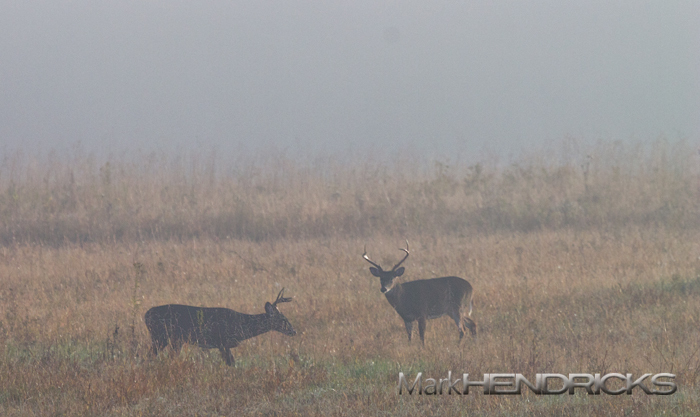 I see quite a bit of females (called “Hinds”) and fawns but during the fall the males seem to vanish. This is mostly due to hunting season. So you can imagine my surprise when I recently caught this young male absconding through the marsh in the midst of bow and muzzle loader season. For a few fortuitous seconds I was able to capture his eye and watched as he began to move towards the edge of a forest. I decided to circumvent the marsh and head directly to the forest, in hope of capturing his behavior. My mind began to romanticize the situation. Maybe there was another male? Could I capture the Sika rut? I saw the magazine cover in my head as I set up my tripod but then I heard a very load sound. It was a shot from a muzzleloader. My heart began to sink. I initially thought that the Sika was killed. Was it my fault? Did I slow it down when it stared at me for those few seconds? If that is the case I indirectly led to its death. I felt sick as I searched in hopes of spotting him. After a few minutes I searched the area behind me and I saw him wander into a camp area that is safe from hunting zones. What a clever animal! Ultimately I do not know if that shot was even intended for the Sika, but for those few moments I questioned whether I should continue taking photographs. I do not want to negatively impact the life of any wildlife I photograph. Thankfully, he is still out there. In closing I wish you a very Happy Thanksgiving. I am thankful for my friends and family who supported me in my wilderness photography. I am thankful to my fellow outdoor photographers who share information and the adventure. I am also thankful for the people who came before me who had the foresight to preserve wild lands. I’m thankful for you for allowing me to share my images and words with you.